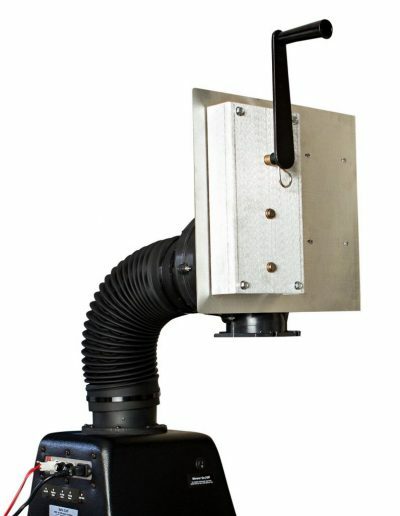 This hand operated air pump mounts on the wall above the Safe Cell at a convenient height and is operated by rotating the handle. It is used to draw filtered air into a protected space during a long term power outage. The handle turns smoothly and is easy to operate. Turning the hand crank at 60 revolutions per minute (RPM) will give an output of 250 cubic feet per minute (CFM). When attached to a Safe Cell, the bank of filters imparts a resistance to the airflow that reduces it to a complete system output of 60 CFM. 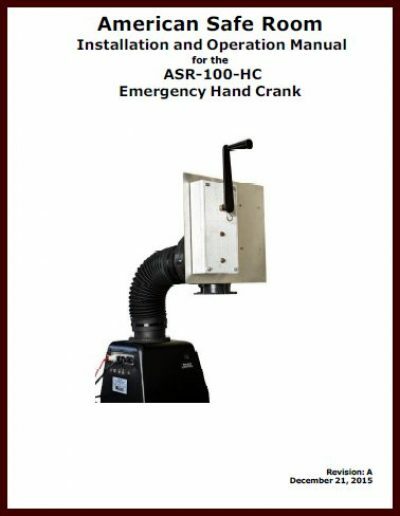 Our ASR-100-HC hand cranked blower may be mounted in any position and features solid steel gears made from A-36 steel, riding in heavy duty oil-lite impregnated bronze bearings, and blower housings made from laser cut aluminum with a matched high velocity forward curved impeller made from Dielectrite 44-10 HG . The old style hand crank is shown above. We are now shipping the style shown on the left with an aluminum housing.